Elucidat allows you to organise your team and projects - this is a critical first step in building an efficient and scalable operation. Protect projects once they go live? Manage projects throughout their production lifecycle? Split teams by business area or specialism? Get stakeholder sign-off and feedback at critical milestones? Build a community of practice by putting a spotlight on best practice? Manage external agencies or third parties? The good news is that Elucidat can support all of the above, with its departments feature. Imagine spending hours and hours on a new project delivery, only to find it has been accidentally changed by a colleague. To avoid this, why not set-up folders specifically for live projects. So, once a project has been signed-off, you can move it into a folder which only admin users have access to. This enables you to effectively manage the lifecycle of your projects and then protect them once they are ready to go live. Find out how to manage folders here. See how to limit author access here. Assuming you are following our recommended 5Cs framework for content development (or something similar), why not set-up folders which represent each stage of your production cycle. That will help project managers see where each project is at. Keep your authors focused on their business area or area of specialism by exposing them to the projects which are relevant to them. This means you can allocate specific styles or formats for verticals in your business, keeping that consistent within each team - but allowing for differences across the business. Find out how to add authors to specific departments here. If you are organizing your folders and departments to reflect a production process, then why not allocate a folder for peer reviews. At this stage you could use our comments feature to invite in comments against your project. Find out how to add reviewers here. Our most successful clients share what they do with each other: why not establish a community of practice to promote best practice. Provide access so that others can use elements of these projects in their own projects. 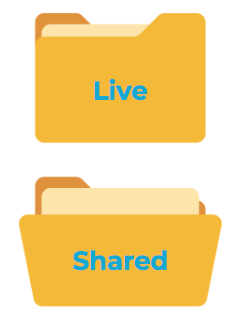 To do this, simply set-up shared folders for your best practice examples. These can then be accessed by others and you can copy out sections or pages for new projects. Find how to add pages or sections from another project here. Often our clients will want to use freelancers, partners or agencies to contribute to or build projects. For obvious reasons, you may want to prevent these authors from accessing other projects in your account. The solution here is simple: create folders and departments for your suppliers, so they can create projects in a protected area. Once they have completed their work, you could move the project into a different folder, or change their permissions. The departments feature is available to customers on our Enterprise plans. If you do not have access to this feature but would like to arrange a free demo in your account, then please get in touch with us here.